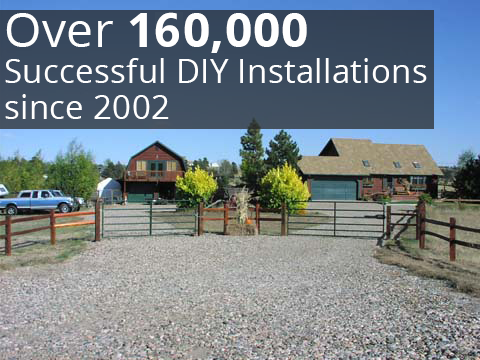 For automated sliding gates, customers throughout the United States have relied on GateCrafters.com for more than a decade. Why? Because our automated sliding gates feature an unmatched combination of style, durability, and performance, all available at a much more affordable rate than the competition. These gates are expertly crafted right here in America using only the highest quality materials, which include airplane-grade aluminum that is a higher grade and thickness than similar products on the market. Our driveway gates are an economical product because they’re all DIY – meaning our customers save a bundle on installation costs, since they don’t have to hire a contractor to perform the work for them. Also, you don’t have to be an installation expert to set up your new driveway gate. We send our gates pre-welded and with all of the necessary resources to help you every step of the way. Our driveway gates also don’t require any bolts, screws, or rivets. Additionally, we have a team of friendly and knowledgeable gate experts that is available seven days a week from 9:00am – 9:00pm. Our experts pride themselves on being the number one resource for our customers, so whether you need help picking out which gate or accessory would be best for your unique needs or assistance with the installation itself, you’ll find the answers you’re looking for from our experienced staff. If you would like to learn more about our selection of automated sliding gates or any of our other available products, including gate openers, please call or e-mail us today.